Matt Barber: War Has Been Declared On Christ - Joe.My.God. “For the first time in American history a woman has been imprisoned by the government for merely exercising her Christian faith. War has been declared on Christ and His followers. And there’s no turning back. Here’s the formula: 1) Force affirmation of homosexual behavior, abortion or some other institutionalized sin via judicial fiat; 2) Christian objects, refuses to disobey God and requests a reasonable religious accommodation; 3) Accommodation is denied and Christian is jailed for “contempt of court.” You’re going to hear that term a lot in coming days, weeks, months and years – ‘contempt of court.’ It’s the straw man charge that will be utilized to imprison not just Christian public officials, but others as well. Christian business owners, lawyers, private sector employees, parents of school-age children who don’t want their children indoctrinated by sexual anarchist propaganda and many others will be held in contempt of court, denied due process and incarcerated indefinitely. The persecution isn’t coming. The persecution has arrived. And that’s what it means to be a Christ follower. So pray for a million more like Kim Davis. 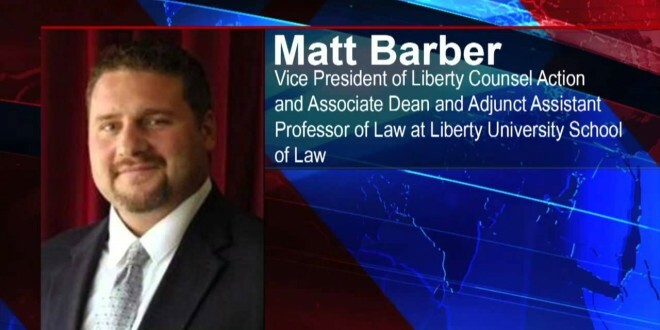 Become like Kim Davis.” – Hate group leader Matt Barber, writing for World Net Daily. FACT CHECK: In the above-linked piece Barber claims that Davis was “overwhelmingly elected.” In fact she won by 465 votes out of 7353 – a rather slim majority.